duvallodge – Duval Lodge No. 159 F. & A. M.
Duval Lodge No. 159 F. & A. M.
Looking forward to a happy and prosperous New Year! Our Lodge’s finances are in order and we do not anticipate any hardship. As a reminder, any Brother who has not yet paid his dues please get that check in the mail! I invite you to join with me as we work together for eventful and positive growth in our Lodge in 2019. As a reminder, we have a Fellowcraft degree on January 22nd. Please be there to support Brother Ayers. Let’s have good communication this year! For my part, I will try to keep the Craft updated with news for and about the Lodge. Our Lodge held its final communication of 2018 last night, and it is a pleasure, truly, to use the occasion to reflect on the year that is passing from us. Our Lodge is able to boast a great many accomplishments over the last year, owing to the service and dedication of so many brothers who gave selflessly of their time and talents. Our Lodge welcomed over a dozen new brothers into the degrees of Freemasonry in 2018! Much thanks for this success is owed to our (retiring) Brother in the East, W⸫ Theodore Burke, the 111th Master of Duval Lodge. W⸫ Ted was steadfast, and set a demanding schedule of standard ritual and degree practice, encouraging us as a Lodge to continue to strive for excellence in the delivery of our rites. This, to increasingly impress—effectively—upon newly-initiated, passed, and raised brothers the mystery and light of Masonry. Worshipful Brother, Thank you! Thank you for your leadership and vision! Our Worshipful Master-Elect, Bro. Randall Boyd, finishes his term as Senior Warden looking to the Oriental Chair. And we as a Lodge are looking forward to his service in the East, where he will no doubt continue to focus on the Lodge’s ritual excellence, while fearlessly showcasing his own voice and style in the tenor of his gavel. A parade of unrivaled culinary achievements will be the legacy of our Junior Warden, Bro. Darrell Cleveland, who now looks to the West. The brethren of our Lodge truly feasted this year, night after night, none going away unsatisfied, and always looking forward to the next occasion upon which they could enjoy Bro. Darrell’s delicious fare. To all our Lodge’s new brethren we say with open hearts and open arms, “WELCOME!” Welcome to the fraternity! Welcome to the incredibly rich heritage and history which is now your due and just inheritance. Welcome to the light; for the light of Masonry will elevate you in thought, word, and deed. We are delighted you’ve become a part of our Lodge family! To all our Lodge officers, you have so much to feel good about, for you have served the Lodge over the course of this year so much better than we could have asked for. And for that, we all thank and salute you! Thank all who were involved in our recent degrees and all who attended, especially our D.D.G.M., R⸫W⸫ Freddie Valasco! Without the tremendous support of the officers and brothers they would not have been as successful as we were. The meals prepared by our Junior Warden, Darrell Cleveland, have been amazing! My thanks to him as well as to his hard working staff. I am asking every brother who has not already done so to consider how they would like to close out this year. I have said in the past that if you have an idea, event, fundraiser, etc., do not hesitate to bring it before the Lodge. Alternatively, maybe you are looking to attend more Lodge meetings, start your path as a lodge officer, or be an active degree team member. There are many ways a brother can help the Lodge, themselves and other brothers. Ultimately it is each our responsibility to address our own goals, identify ways to improve an help the Lodge be successful. As a reminder we will be looking for 2019 officer nominations. I look forward to seeing you in lodge! Lastly to all my brothers, thank you for your service and support! When we started this year, two of my goals dealt with Masonic education and Craft participation. To date, YOU (Duval Lodge No. 159) have surpassed expectations and set a precedent for our all of us. I can only imagine that we will expound on the strides and accomplishments made thus far. I will continue to emphasize the importance of our education program, moreover the importance of adhering to our Masonic doctrine. Meaning, implementing what the text state, not how some interpret things ‘ought’ to be. Craft participation was recently highlighted during our recent 2018 Annual Grand Communication in Orlando. Duval Lodge No. 159 had ten members representing and present. That is outstanding! Additionally, after a large number of our members attended Ribault Lodge No. 272, we were able to retrieve our Traveling Trowel. I am looking forward to returning the favor; continuing to meet, greet, and break bread with other Lodges. Although we have not officially elected to go dark for a summer month, I am anticipating the month of August will be our chosen time frame. Future Degree practices during that time are TBD. Lastly, I would like impress the importance of charity. I encourage everyone to continue contributions to the Charity of the Quarter, L.Y.P.M.G.S. As always, donate within our capabilities. This program was initiated in 1958 with the intention to utilize donations in operating the Masonic Home. Any amount will and does help. Thank you for your support. The year is starting very good with four new Master Masons and two new Fellowcraft. It would be great if you could put Duval Lodge on your calendar and attend some of these meetings. Let us hear from you! Come and support the Lodge and our new brothers! It is an honor to have been elected as Master for 2018. I want to thank all of the Brethren for their confidence and support. Moreover, I want to thank you all for your hard work and contributions to our Lodge and fraternity. I also want to thank (retiring Worshipful Master) W⸫ Ronald Tennant for his dedicated service to the Lodge. I am focused on picking up where Ronnie left off, in hopes of a smooth transition. I have a strong emphasis toward community involvement, membership, Masonic education, participation, engagement, and communication. I will be asking each of you to remain dedicated and make every effort to attend our stated communications. Your participation is vital to guiding and raising new brothers as well as helping us in our endeavors. Finally, I look forward to this year. I know it will be challenging, but rewarding as well. Happy Birthday to our Worshipful Master! 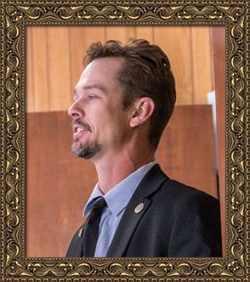 Please join us in wishing a very special and HAPPY BIRTHDAY to our Worshipful Master, W⸫ Ronald “Ronnie” L. Tennant Jr.! 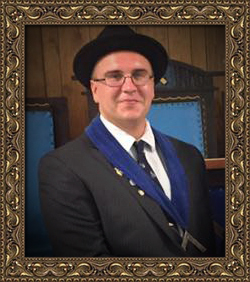 W⸫ Ronnie is our Lodge’s 109th Master and turns 30 years old today. He has presided over a touchstone year for our Lodge as we have welcomed in many new Brothers from diverse backgrounds and labored to make our degree work truly exceptional. HAPPY BIRTHDAY WORSHIPFUL! We, your Lodge Brothers, salute you! It’s now September, and we have had a few weeks without Stated Communication. I tend to view this as a reflection period on where we have been and ensuring the compass is oriented correctly going forward. One of my reflections has been on an important function of Masonry; to make Master Masons. I understand this not to be a turnstile of men, making their way through the Degrees of Freemasonry. Rather, it is the important responsibility of all Master Masons, ensuring we are educating and guiding those looking to become Master Masons. It is easy to rely on educational events or lodge instructors to fulfill this task. However, these are in place as supplemental initiatives. Becoming a Master Mason and carrying ourselves as Master Masons, rests on the collective members of the lodge. The WM is maintaining our charitable donations to the Sulzbacher Center. If you have questions on how or what to donate, please contact one of the Lodge Officers. After being dark in August – a nice break to be sure – we are rolling up our sleeves and getting back to work! Join us tonight for our first Stated Communication of September as we get back to the labors of our inspired and ancient fraternity. Much progress has been made in our Lodge during this Masonic year, owing to the hard work of our officers, brethren, and many newly-raised brothers, to make our degree work, ritual, and the way we conduct business, an outstanding example of the best traditions of our fraternity. We invite you to come out and show your support. Help us to continue this great work! Dinner will be served at 6:30 p.m., the Lodge opens at 7:30. After a dark month and time to reflect, a lot of changes have been made. Things have happened at our lodge that we hope all of you brothers will come and see and support the lodge in our upcoming degrees and practices. Every Tuesday we attend lodge whether for Stated Communication or it be practice for a degree we plan to put on. All of this can be helpful to the entire roster of Duval 159 members but more especially the newest raised brothers. I hope to see all of you in the lodge every week if possible. We can all use as much support from everyone as they may provide. May we all be remembered as builders! I want to start by saying thanks to everyone who has participated in our break and Lodge cleanup day. I would also like to extend a big thank you to everyone who has donated canned food and dry goods for our food drive. To date, we have collected 4 boxes of food and sent it down to Sulzbacher. Keep up the good work! W⸫ Ronald L. Tennant Jr.
We continue to see the great accomplishments of our new members as they advance through the degrees of Freemasonry. Congratulations to them on their progress. I would also like to say congratulations and thank you to Past Master W⸫ Bill Watson and our Senior Deacon, Darrell Cleveland for their continued hard work and dedication. These brothers emulate Freemasonry by devoting themselves to educating new members. If you haven’t been to the Lodge recently, you should make a point to stop by. With help from the brethren, the Junior Warden has worked hard to sustain the first Saturday of the month for Lodge cleanup and breakfast. The results are outstanding! On that, all I will say is, fresh paint! If you have an activity or idea you think the brethren could take part in, be sure to bring it up at one of our meetings. I would like to ask you: why did you become a Mason? We all have our reasons why we joined. For some, it was following in the footsteps of a family member or family tradition. For some, it had more to do with helping the community or those in need. But really, why did you join the world’s oldest fraternity? When you see me in the Lodge, ask me this question and I will be happy to share my own reasons and talk to you about yours. I look forward to seeing you in the Lodge. So far we are having a very good year! We have four Entered Apprentices coming along and we will have three new Master Masons raised this month. They will be raised at Arlington Lodge on 25 April, 2017. Please come have dinner and enjoy seeing your new brothers raised. On a not so good note, we still have brothers who have not paid their dues for this year. Late notices have been sent. Your Lodge dues pay to keep the lights and water on, along with other bills when due. Please remember you Lodge and your obligation. Become active in your Lodge and you will be surprised how good you will feel. I would like to express my gratitude to the great majority of you who have paid your 2017 dues. For the few who haven’t, please get that check in the mail. Better yet, come to Lodge Tuesday night and hand it to me. It would be an honor to see you! Hope to see everyone in Lodge! There are two things essential in the proper running of your Lodge: dues and bodies in the seats at every meeting. Without your timely payment of dues, we cannot pay our fiscal obligations. Without you in the Lodge, we cannot properly maintain Lodge business. If you have not as yet paid your 2017 dues, please do so at your earliest convenience. On a somber note, as reported in the last Trestle Board, we lost two of our “50 Plus” members to the Celestial Lodge. I ask the brethren to pray for us all. Please come, fill a seat and enjoy the fellowship! I hope to see more of you in Lodge! I trust everyone has a joyous holiday season and may the blessings of Heaven rest upon you in the coming year. First of all, I would like to welcome all our new brothers to the Fraternity. Your new journey will be a memorable and rewarding one. Next, a special thanks to W⸫ Ed Miller for supplying the food for our installation. The help of the Eastern Star and the Rainbow Girls was awesome! Without them, our travels would be much more difficult. We have implemented a few new items to our agenda this year and everyone’s cooperation would be welcomed and appreciated. Our first “Breakfast and a Chore” was a success. We are meeting the first Saturday of each month for breakfast followed up with some light cleaning duties. The maintenance of our Lodge is paramount. If you don’t feel like cleaning, you are still invited to breakfast at 9 a.m.
We are also going to be collecting non-perishable foods to be delivered to the Sulzbacher Center for the homeless. Please bring any extra food (canned goods, cereal, dried fruits, etc.) so we can further help the needy citizens of our community. The food drive will be going on all year so please clean out your pantries and feed someone less fortunate. W⸫ Bill Watson is doing an amazing job instructing our new brothers and degree team. Please come out the 2nd and 4th Tuesdays to lend a hand with degrees or just watch him work. Thanks again to W⸫ Kevin Spargur for his help with the Tresle Board. Without him, our communication would be lacking. If any Brother has any ideas to help with the Lodge or better our community, please don’t hesitate to contact me or any of the officers. I hope everyone has a blessed and healthy spring! As this column goes to the editor, February is winding down, and we are gaining momentum! March, April, and the rest of the year are shaping up to be a great and active year. Our renowned Brother, George Washington, was the first President of the United States. He was born on February 22nd, 1732. There are many interesting pieces of literature on Washington and I recommend everyone take a little time to research and learn about this great man and Mason. The WM has initiated a campaign to assist the Jacksonville Sulzbacher Center by donating canned foods and dry goods. I urge all of us to participate in this effort, as Charity is an all-inclusive idiosyncrasy of Freemasonry. Donations can be dropped off at the Lodge at your convenience. Congratulations to our Brothers who have recently made further progress in their Masonic degrees. These are great achievements and I am eager to see their next steps. I would like to once again thank all of my brothers for electing me to the South. Luckily, my wife Sandy will be providing most of the talent in that area. Know that I will strive to stand uprightly in the South! The coming months will include some excellent Italian, Hispanic, and Mediterranean dinners that everyone will really love. If possible, please give me a call or send me a message if you plan on attending dinner at the Lodge to help me in making sure there is enough for everyone, at (904) 307-0442. Thank you again, Brothers! See you in Lodge! I hope everyone had a safe and relaxing holiday season. It’s the New Year and I’m really grateful for all of the cooperation and assistance I have received thus far. The objectives for this year are going to be unity and community outreach. I believe if we come together as a Masonic body, we can make a real difference in our neighborhoods and, ultimately, the world. With our manpower and resources we can help a lot of people. Remember, the only difference between a good idea and a great accomplishment is ACTION. Let’s get together and bring some Faith, Hope, and Charity to the world. A new year has started and I find myself in an office I didn’t expect to fill for a while. So, to begin, I would like to thank the outgoing Worshipful Master, W⸫ Vernell Robinson, and all of his officers for their work and dedication. These brothers have continued to exemplify what it means to be a Mason. Thank you, Brothers. I would also like to congratulate the new brothers who are beginning their journey in Masonry. As a fraternity, with the new brothers entering the Lodge, we are reminded that we must be ready to aid and assist those who need our help, especially a brother Mason. I am humbled and proud to be given the opportunity to sit in the West this year. I will continue to do my best for the Lodge and am looking forward to a new year of friendship and brotherly love. I want to thank the brothers for their confidence by electing me as Junior Warden for 2017. Replacing the Junior Warden, our worthy Brother Peter Danish, will be difficult. I am hoping I can merit the trust placed in me. I am sure we can supply good meals for the Craft. I don’t have a menu, as such, but the next Trestle Board will. Please feel free to let me know if there is something specific you want or if you have specific dietary needs, requirements, or restrictions. Hoping to see you in Lodge! WELCOME TO DUVAL LODGE No. 159 F. & A. M.
W⸫ Randall Boyd, 112th Master of Duval Lodge No. 159, F. & A. M.
Enter your email address to subscribe to our digital Trestle Board and receive notifications of new posts by email. Dinner: 6:30 p.m. Lodge opens: 7:30 p.m. Copyright © 2017, Duval Lodge No. 159 F. & A. M.